The superstar calls Mandela a "strategic warrior" in the heartfelt tribute. Beyonce is gearing up to perform at the Global Citizens Festival: Mandela 100 in South Africa, and she took time to pen a powerful open letter to the late Nelson Mandela on her website. 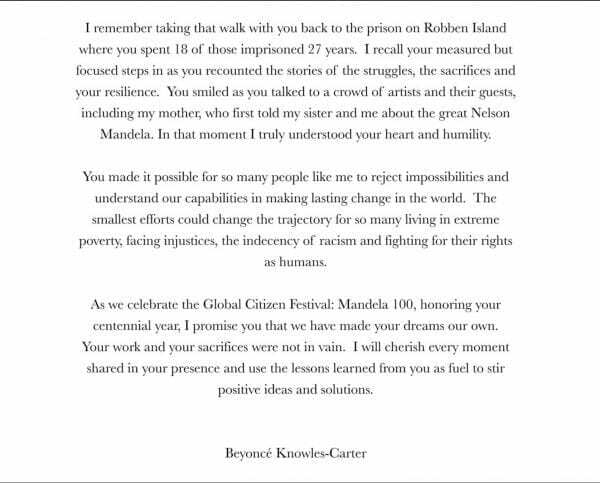 In the touching tribute entitled “Dear Madiba,” she recounts first meeting Mandela in 2004. “I first met you in 2004 at the 46664 AIDS Benefit Concert in Cape Town, and the impact you have had on my life resonates with me today and every day. Your kindness and gratitude for every experience, and your ability to forgive are lessons I have learned and will pass on to my three children. My entire family holds you in high regard,” she wrote. The superstar shared some sweet snapshots of time spent with the late leader. “You made it possible for so many people like me to reject impossibilities and understand our capabilities in making lasting change in the world. The smallest efforts can change the trajectory for so many living in extreme poverty, facing injustices, the indecency of racism and fighting for their rights as humans,” she continued.